MOSCOW _ An explosive device killed 10 people and injured at least 50 others at a vocational college in Crimea Wednesday in what Russian officials called a possible terrorist attack. 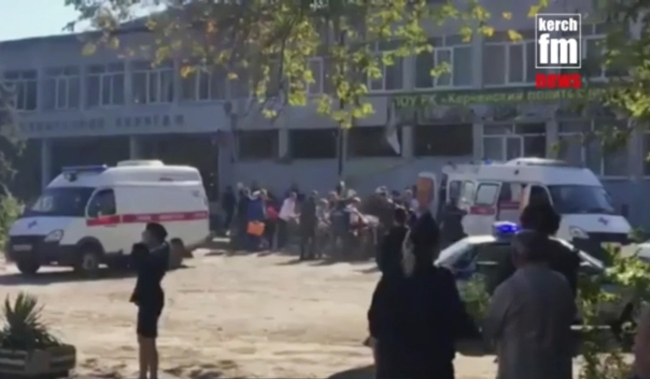 The National Anti-Terrorism Committee said in a statement that the blast at the college, in the city of Kerch in eastern Crimea, was caused by an unidentified explosive device. The committee's spokesman Andrei Przhezdomsky said sappers are inspecting the building for other explosive devices. The Tass news agency reported that most of the victims were students, quoting local ombudswoman Lyudmila Lubina. Russian President Vladimir Putin's spokesman, Dmitry Peskov, told reporters that officials are looking into a possible terrorist attack. He did not elaborate. Peskov said Putin has instructed investigators and intelligence agencies to conduct a thorough probe and offered condolences to the families of the victims. Emergency officials have earlier said that the blast was caused by a gas canister explosion. The head of Crimea, Sergei Aksyonov, and Russia's Health Minister Veronika Skvortsova haded to the area to coordinate assistance to those injured.